A 24-seat counter bar restaurant in Neal’s Yard, from the people behind The Palomar. So you thought you loved the Palomar. You thought you’d be faithful and true. But that was before you met little sis the Barbary. It’ll make you want to quit your job, pack your bags, and run away into the sunset together. The Barbary, you see, takes everything that’s good about the Palomar but ditches the bits that don’t quite work (like the fact that the ‘fun seats’ up at the counter are also the most cramped; or the fact that the raw bar is the weakest link on the otherwise stellar modern Israeli menu). 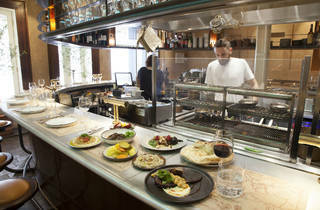 At The Barbary, all the stools are arranged at 24-seat horseshoe shaped counter bar. Down one wall, there’s a standing counter, where they’ll feed you moreish bar snacks (like deep-fried pastry ‘cigars’ filled with cod, lemon & Moroccan spices) while you wait for a seat. And if the queue spills outside, you’ll find yourself in pedestrian-only, full-of-character Neal’s Yard. As places to loiter go, it’s not too shabby. Oh but the food, the food. 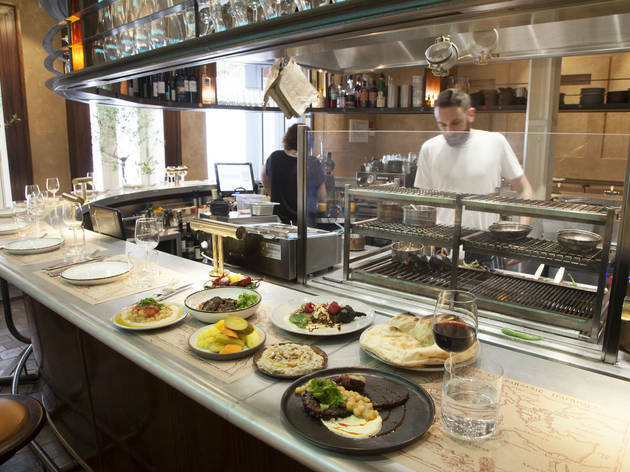 Where the Palomar is intentionally progressive, looking to push the boundaries of ‘Israeli’ food, the Barbary looks to the past. 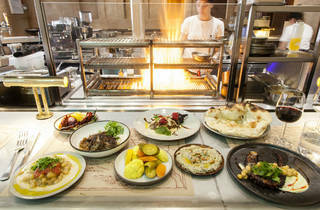 The team, led by Tel Aviv-born chef Eyal Jagermann (ex-Palomar), have scoured the wider region, travelling down the eponymous Barbary coast (the stretch of north Africa from modern-day Morocco to modern-day Egypt) to revive the dishes that have informed their own culinary heritage. The signature ‘naan e beber’, for instance, is made to an ancient recipe for leavened bread, with just four ingredients (flour, sugar, salt and yeast). The flattened, kneaded dough is slammed into a fiercely hot tandoor for just a minute or two, quickly re-emerging all fluffy and blistered. When you can get this excited about bread, you know great things are about to happen. Great things like the octopus. Slow-braised with oranges and bay leaves in its own juices, the chefs wait until it’s soft enough to fall apart before slinging it on the coal-fired robata. Silky on the inside, charred on the outside, I’m declaring these the best tentacles in town. Equally tender and smoky was the chicken ‘msachen’, a dish you get at Israeli parties. At The Barbary, the skin-on thigh meat is marinaded in a yoghurt, sumac and baharrat (a Syrian/Egyptian spice mix) for a full 24 hours before cooking. It’s a bit of a theme: everything here is made from scratch and with care. For dessert, order the knafeh – a sandwich of finely-shredded filo pastry filled with white mozzarella and goats’ cheese. 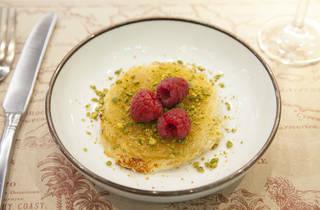 Pan-fried until it’s crispy on the outside, chewy on the inside, it’s then sprinkled with roasted pistachio nuts. Try pressing it gently with a fork and watch it ooze puddles of clarified butter. This is not food for the uptight, but for people who live life to the full. On my midweek visit, every seat was taken by 6.15pm, the atmosphere was electric, the air filled with charcoal smoke, music and laughter. The Barbary: a place to fall joyously, head over heels, lightning-bolts-R-us in love with. Mouthwatering flavors that will not disappoint! Today for lunch a friend and I decided to go and try Time Outs number 1 restaurant. We loved everything we tasted, from the creamy Ikra starter with Naan bread freshly cooked in the Tandoor Oven right before your eyes to the Blackened salmon. Apart from the delicious food, sitting on the stools surrounding the kitchen and watching the chefs at work is an absolute treat! I am a huge fan of sitting at a table with a view of the kitchen so to be practically sat in the kitchen was wonderful! The service we had from the wait staff was top class! He knew everything about the menu and gave us great recommendations. I could not recommended this place enough. My tip would be to go early in the week at lunchtime or early afternoon to grab a seat straight away. Yes this place is spenny but it is worth every penny for the quality of dishes they put out, 5 Stars! If you're looking for fine food within a casual dining experience, you cannot afford to miss out on The Barbary. 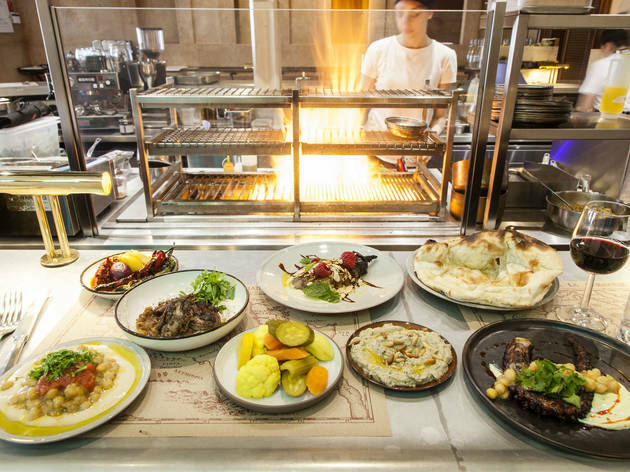 Serving North African cuisine, the restaurant consists of bar-stools spread around the big bar/kitchen in the middle, where you can watch the chefs turning fresh produce into delicious goodness. Think of it like the North African version of Teppanyaki where you can watch chefs doing their magic. It may seem expensive and the portion sizes relatively small, but it is a sharing kind of place and charges no service charge, so you pay for the service what you deem fit. I've been there once and will be back for many more nights of culinary excellence. Really cannot agree more with TimeOut’s rating of this restaurant (number 1 in London in 2017). The hospitality is amazing and the food so so so delicious. With only 24 seats this restaurant has the same intimacy as a chefs table experience. Watching the chefs do their thing really is something special. Go go go go! Best meal I've had this year! I loved every bit of it - stepping into the wonderful smokey smells, the friendly and knowledgeable staff, seats at the bar where you can view the kitchen and grill. And of course, the FOOD! 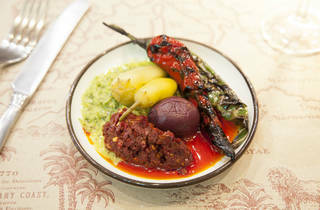 I can recommend every single dish, they are all packed with so much spice and flavour. Not cheap as dishes are small and designed to be shared, but it's really worth it! The only downside is it's a small restaurant and there's usually a queue. Can't wait to be back! Wonderful experience at The Barbary! Love that the only option is to sit at the bar. You’re able to interact with the waitstaff over the counter and watch your dishes being created in action. Service was wonderful, very attentive and gave some great recommendations. Food of course was wonderful! 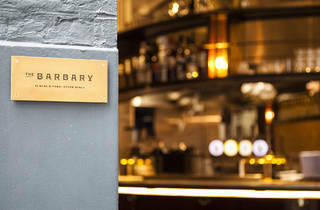 The Barbary, Covent Garden is definitely one of my favourite London restaurants. Serving Berber-inspired food, the flavours are as indulgent as they are simple. In my opinion, this restaurant really has its handle on serving up mouthwatering dishes. However, portions are small and are intended for sharing - and it isn't on the cheap side. My favourite dishes included the Jerusalem bagel with dips, and the smoked cigar and goats cheese ice cream, pictured below. 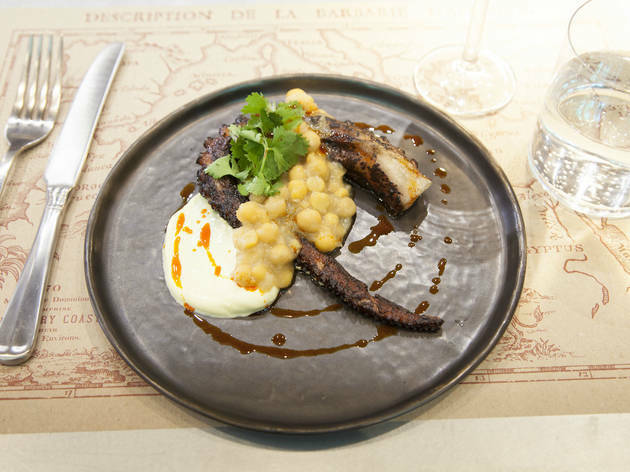 I really enjoyed the charred octopus tentacle topped with mashawsha (a style of hummus with whole chickpeas) but the price of this plate was pretty steep, at £17.50. So, you have to be mentally ready to fork out two tenners for a tentacle. There are no bookings so be prepared to queue unless you’re eating slightly before everyone’s off work. We went at 6.15pm and we found seats straight away. Although the atmosphere and the food is great, I am rating it four stars for the portion-size to price ratio. This tiny restaurant is located in the narrow alleyway between Shorts Garden and lovely Neal's Yard. I'd better warn you: expect to wait for a WHILE if you don't get there by 6pm max. Once some seats are free, you will be sat at the bar that surrounds the kitchen in the main and, as far as I know, only room so you will be able to actually see your meal be prepared as you wait. It won't fail to make you salivate! My friend and I ordered quite a few differents starters and mains: lamb kafta, octopus, fishy pink creamy dip, chicken liver pate and freshly baked naan... It was all really tasty. I am personally not a fan of the fish dip or octopus but my friend said he loved both. This very small restaurant that opened last year in Neal’s Yard Covent Garden and is one of my favourites in London. As I mentioned the restaurant is really small and most of the seats (the best ones) are wrapped around the kitchen, which is in the centre of the restaurant so you can watch the chef’s cooking your food. Because the restaurant is so small you have to sit on high stools VERY close together, so it is quite intimate and you are forced to be a bit up close and personal, so maybe take someone you are sure you already like at least a little! This place is for couples – doesn’t really work in three’s. The food is SO good I highly recommend the hash cake, it's truly amazing. The menu reflects the countries from the Atlantic Coast, through to the Mediterranean Sea leading to Israel, taking inspiration from Morocco, Algeria, Tunisia and Libya – so it’s a little different. Also all the plates are small so you get to share and try lots of different things. We massively over ordered and didn't regret it, we tried the Naan e Barbari, Jerusalem Bagel, Baba Ghanoush, Lamb Cutlet, Pata Negra Neck, Onglet Pebrella and the aforementioned hash cake - literally if you don't order it you are making bad life decisions. You can't book so make sure to turn up early and be prepared to wait with a drink. Gosh, what a little gem! We've been twice and it is fantastic. All the food is themed around the Barbary coast which spans the eastern edge of the Mediterranean. The tapas-style dishes are full of flavour and easy to share, try the flatbreads and dips. The style and layout of this beauty is almost as fantastic as the food. I loved the bar/eating counter focused around the kitchen at the centre. You can watch the chefs make your food and then keep adding what you see to your order. A must-go, but turn up only because this fair system is a no-booking-zone. 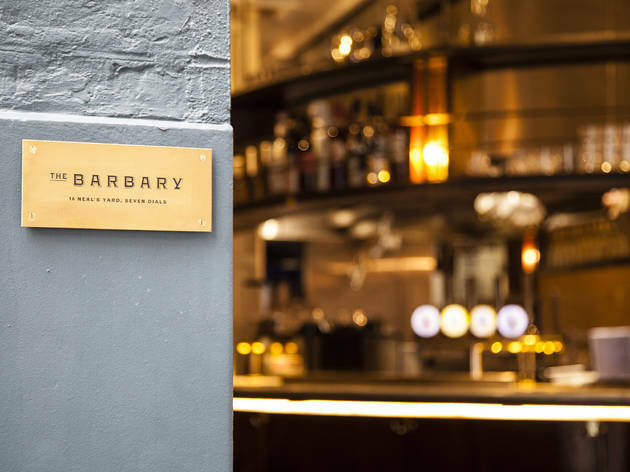 The Barbary is located in the colourful and vibrant Neal’s Yard and all of the seats are situated at a horseshoe bar surrounding the open kitchen. It’s fun to be able to watch as the chefs prepare each small plate with care. Due to seating arrangements I feel that this restaurant is best suited to dinner for two since it would probably be hard to visit with anyone two seats away. All of the dishes that we ordered were delicious and I wanted second portions of them all at the end - not because I wasn’t full but because they all tasted amazing. The only exception would be the hashcake which I ordered for dessert, it was quite dense but not as nutty as I was expecting. Other than that the pumpkin dip, sesame bread, fattoush salad, halloumi and everything else were great. We mainly ordered vegetarian dishes which all came out quite promptly but there was quite a delay between these and the monk fish. I guess if you were ordering more meat dishes there would probably be more flow to the meal. By 6:00 on a Monday night there were still a few seats left but I would expect later on in the week that the restaurant would already be full by this time. The Barbary offers complimentary still or sparkling water and an optional £1 donation is added to the bill for the Street Smart charity which I thought were both nice touches. Service was attentive, prices were fair and the flavours were fantastic - this is definitely somewhere I will be going back to! In my view the best restaurant I've eaten in London for the last 5 years at least. 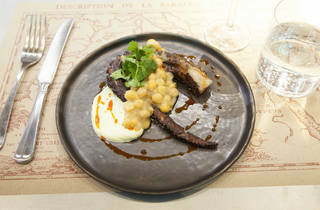 The Pata Negra Pork and Grilled Octopus are unbelievably good. They also make the best naan breads. The informal friendly atmosphere also adds to the whole amazing food experience. Great place with authentic Israeli flavors. I hate queueing. What I hate even more is having to queue for a new restaurant only to be a bit disappointed. Thankfully not only was I not disappointed wiht The Barbary, I would happily queue for 2 hours if it means eating that food again! The restaurant is tiny, 24 covers on bar stools around the open kitchen. There are a few stools along the wall that are for drinks while waiting for a table. We were lucky, arrived at 6:15 and only ended up waiting for 20minutes, I think the maitre'd took a liking to us! We sat down at the bar and were soon chatting to a waitress about the menu and asking her advice on what to get. The menu is split into land, sea and earth and some smaller plates. As is the norm nowadays, it's all sharing. We had some cod filled moroccan cigars, arayes (lamb kofta cooked inside a mini pitta), swordfish, yoghurt marinated chicken, sirloin steak with what I can only describe as dijon mustard jam and a few other dishes too. For me there were 2 stars of the night. The aubergine, charred on the grill with a nutty tahini sauce, chillis and herbs, seems quite normal but then they threw in some flaked almonds and fresh raspberries. Raspberries, tahini and aubergine really should not go but I am never going to eat aubergine without raspberries again! It was a magical combination. The other star was one of the desserts, we had knafeh which is an arabic staple of goats cheese and mozarella in kadaif pastry and syrup. That wasn't the star. The star was the "hashcake" presumably named as it's that good and potentially addictive. This dense, sticky pistachio sponge comes with a dollop of whipped cream and a crumbly pastry crust. It is delicious. In summary, go to The Barbary, queue as long as it takes. I promise you it's worth it. I visited Barbary a couple of weeks ago , half an hour before their closing time at lunch hours and did not have to queue at all. I sat at one of the seats at the bar, which I think is a great way to experience the dynamics of a restaurant and it for sure allows for a better and more attentive service.From the dishes I ordered, the Moroccan cigars with yogurt sauce were saved by the yogurt sauce, the Zhug - pickles platter was to the point and the lamb cutlet zuzu was outstanding with succulent lamb meat and delicious yogurt sauce and the pickles complimented it perfectly. I've found the highly anticipated Knafeh too buttery for my taste: but overall Barbary left a very good impression with great and friendly service and delicious take on east Mediterranean cuisine. First things first stop reading and go get in the queue. Now you are queuing patiently you are in for a real mouthwatering eye popping treat. The place only seats 20 something people at a time and they are all at the bar face first in the cooking action. This is not the place for groups but would be an amazing date venue. The staff are superb at explaining the menu so I will leave the description to them, just make sure you leave space for pudding. Tucked away in Neal's Yard in Covent Garden, this new restaurant is a buzzy and intimate place with exceptional food. Get there early - you can't book - and grab one of the twenty-odd seats at the counter. From here you can watch the staff fishing out flatbreads from the clay oven or flaming octopus on the grill. The menu needs a bit of explaining (it's on the minimalist side) but when I went the staff did a sterling job of describing the dishes, and as it's made up of small plates you can order loads and try them all! 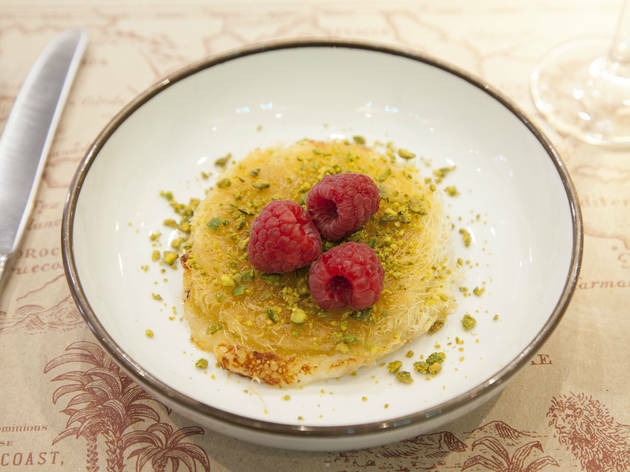 Don't forget dessert and in particular the amazing knafeh - it's a melt-in-your-mouth treat. Go now, before the crowds do! The Barbary is THE go to place in London right now. Brilliant food, fresh, colorful, middle eastern dishes that are just mouthwatering. 5 stars easy! "What they’ve done is taken the ancient recipes from across north Africa (from the one-time Barbary coast) and the Middle East that have gone on to influence food in today’s Israeli kitchen" I have been to the place and it is lovely but lets not beat about the bush here, what they have done is taken food from the Arab world and re-christened it Israeli food. Not a bad thing in itself but it would be better to just be honest about it instead of this convoluted explanation which is akin to Pizza Hut describing itself as taking recipes from across the southern Mediterranean (the one time Roman empire) which have influenced modern American cuisine! !